The company he keeps, reveals some of the most important and highly valued causes, Elie Hirschfeld supports – social justice, economic prosperity, health and culture and Israeli international relations. Danny Danon was a Member of Israel’s Knesset from 2009-2015, served as Deputy Speaker, Chair of the Committee on the Rights of the Child, and a member of the Labor, Welfare and Health Committee, House, Constitution, Law and Justice, Foreign Affairs and Defense, Education, Culture, and Sports Committee, and Immigration, Absorption and Diaspora Affairs, as well as on the Committee on the Status of Women and Gender Equality and the Committee on the Rights of the Child. In May 2015 Mr. Danon was appointed Minister of Science, Technology, and Space, serving until his appointment in August 2015 as Israel Ambassador to the United Nations. 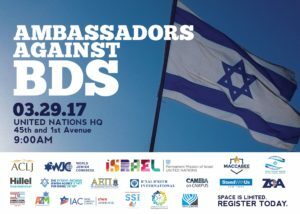 Elie Hirschfeld strongly supports Danon and Haley, who spoke forcefully about the importance of efforts to change the tone at the United Nations, and the need to continually strive for awareness of issues surrounding BDS, and support world leaders in the United States, Israel and beyond.